Waxing at Zen provides clean hair removal without the risk of cuts, razor bumps, rashes or irritation caused by a dull blade. Shaving sensitive areas such as the bikini line can be painful with a razor, so why risk it? After waxing, hair growth is generally stunted for four to six weeks as opposed to a few days with shaving. 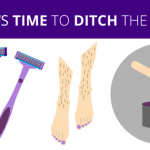 Weeks of being hairless will save you time plucking, shaving, and tending to unwanted hairs. As waxing will remove hair at its root rather than skimming the surface, this can reduce the thickness and abundance of growth over time. After three to four appointments you will notice hair growing back less thick and noticeable. Keeping a regular hair removal regime throughout the year will not only keep you hairless longer, but will have lasting results on overall hair growth. Waxing appointments are quick and easy, giving you plenty of time to go about your day. You’ll be in and out in less than 30 minutes (depending on what area you have waxed) ideal if you’re popping in before or after work. Waxing is available in all of our convenient Edinburgh City Centre locations. For waxing prices check our waxing treatment page here.